The California Cattleman Magazine is the official publication of the California Cattlemen’s Association. The magazine is sent to CCA members and subscribers monthly and is one of the best sources for beef production information in the country. To subscribe to this publication for only $20/year, please call the CCA office at (916) 444-0845 or consider becoming a full member to support ranching and receive the full benefits. 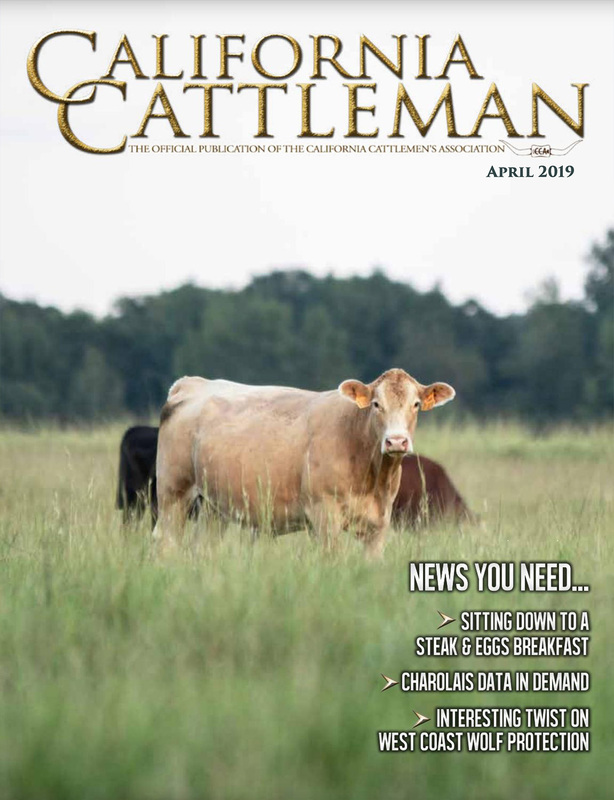 If you are interested in advertising in the California Cattleman, please contact advertising coordinator Matt Macfarlane at (916) 803-3113 or m3cattlemarketing@gmail.com. For questions or suggestions regarding editorial content, please contact managing editor Stevie Ipsen at (208) 996-4922 or stevie.ipsen@gmail.com. 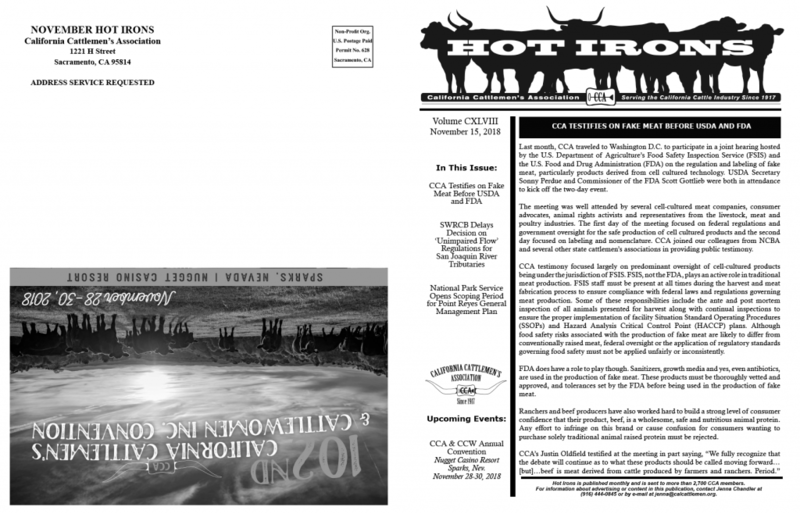 As a benefit of your CCA membership, the CCA Hot Irons Newsletter is delivered monthly and primarily contains information about happenings in the cattle industry and news from Sacramento and Washington, D.C. If you do not currently receive this newsletter but would like to, contact the CCA staff at (916) 444-0845 to learn more about joining CCA. If you are interested in advertising in Hot Irons, contact Jenna Chandler in the CCA office. If you did not receive the current issue in the mail please contact the CCA office. 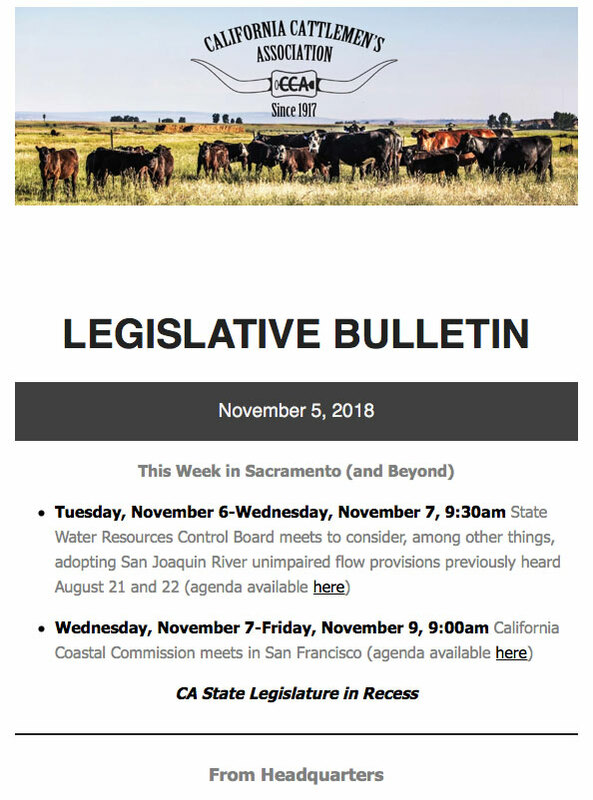 Fill out your contact information to start receiving our weekly Legislative Bulletin newsletter. It’s the best way to keep up with all things CCA and California beef. Now more than ever it is critical ranchers share their voices and work together to protect our industry. There’s never been a better time to join the CCA!